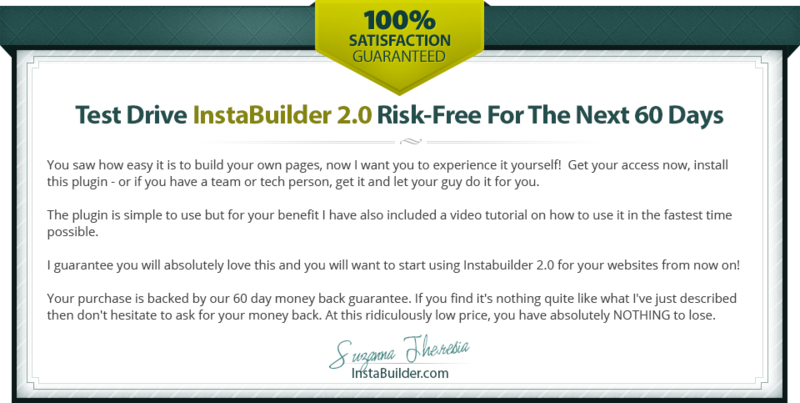 All landing pages created by InstaBuilder are fully responsive, and you can control what you want to display on desktop, tablet and mobile devices. Add urgency using InstaBuilder's beautiful countdown timer. Easily add pop-up and slider to your landing pages with ease. Create unlimited design variations on each of your landing pages to find which one have the best conversion rate. Seriously! We're NOT going to wait until the above countdown ends to increase the price. We limit the 30% discount ONLY to the FIRST 100 people, then we'll raise the price immediately... without any notice! Don't Forget... The 30% discount applies to all available licenses. You can see the original price of all licenses at our sales page here. *NOTE: This is a one time payment, and there is no recurring billing. Upon checkout, enter the coupon code we sent you via email to apply the discount. WAIT! NEED THE 30% OFF COUPON?